Nebhub Enterprise Resource Planning ( ERP ) runs your back office and creates efficiency by utilizing automated workflows across departments. Nebhub CRM helps to organize, track, automate and nurture leads like no other customer relationship platform. Harness the power of your people and go beyond managing to empowering. Service today is not like before. It's fun. It's engaging. It's about creating a red carpet experience for your customers and employees alike. Personalize the experience and deliver the right message at the right time. Nebhub facilitates every facet of site development and globalizes resources across the network. From getting started and all the way through site selection, LOI, draft lease, lease signed, construction, training and finally to open, Nebhub Site Development has you covered. Automate task management and have the ability to make changes globally across all locations instantly. Manage brand compliance and provide corporate approval throughout the build-out phases. Ensure documents are uploaded into a task before allowing the site to move to the next phase. Allow corporate project managers and resources to collaborate with Regional Developers, Franchisees, Architects, Contractors & Third Party Vendors. In conjuction with the Nebhub B2C Commerce & Nebhub Marketing Portal, the Franchisor can automate the purchase of grand opening materials, post open marketing and provide the ability for Franchisees to purchase their studio start up kits all in one place. In conjuction with the Nebhub Location Mangament, the Site Development module allows corporate to link a location status to the completion of a task. When a task is completed, it automatically launches the Grand Opening Microsite, Pre-Opening Microsite or the Open Microsite on the website. Determine which phases and departments are taking longer than others to help create effeciencies. After all, our main concern is helping to get Franchises opened as quickly as possible while maintaining brand guidelines and processes. Know exactly where your locations are and forecast upcoming open location revenue and royalties. Nebhub's LMS provides automated internal and external learning programs in one easy to use system. Get your online store up fast with Nebhub's B2C & B2B Enterprise e-Commerce. For Restaurant Franchises, Nebhub's B2C Commerce features the "Create Your Meal Checkout" allowing customers to customize their meal items. 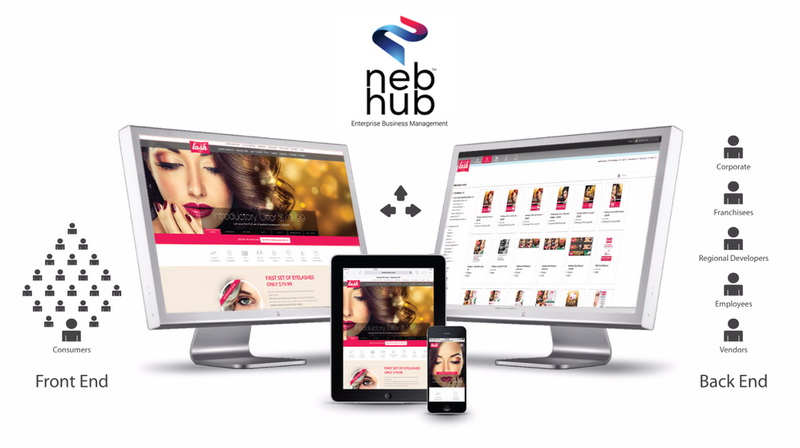 Nebhub websites are designed to match your brands identity and are tailored for franchises. Nebhub websites offer scalability, automation and best of all, pre-integration into all Nebhub products including Nebhub CRM, Nebhub HCM, Nebhub Marketing & Nebhub Site Development. Franchisees can manage their microsites and their leads. The microsites are pre-integrated into the Nebhub CRM and allow Franchisees to manage appointment requests, career submissions, service requests, refer a friend requests and gift card submissions. Nebhub Site Builder also enables third party SEO, Social Media & Digital Marketing vendors to help promote microsites and generate more leads. Used By Some Of The Fastest Growing Franchises In The US.